Social Scum, in my mind, was a rival to D.O.S. I am not sure if that it is fair to say that now, but in those days it seemed to be so. I do not think I heard them play, although they shared the same rehearsal space as ‘Societies Victims’ in the basement of The Wheel. We never met, it seemed we kept out of each others way! The fan base was divided, with a following for either Social Scum or for DOS. A lot of it passed me by, but you would hear stories of this or that gig ending in fights. 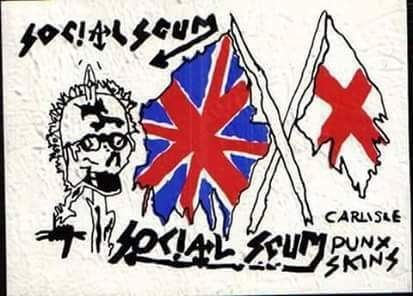 I can’t find any recordings or photos, but it is fair to say that Social Scum was a fixture of the Carlisle punk scene. Not sure of the songs they sang either? Jimmy Johnston kindly sent a ticket from one of Social Scum’s gigs. I would value people input on this band as not much is known about them.